With all our moving chaos, I almost forgot that today was the anniversary of D-Day, until I overheard my oldest son and husband started laying out its timeline last night. 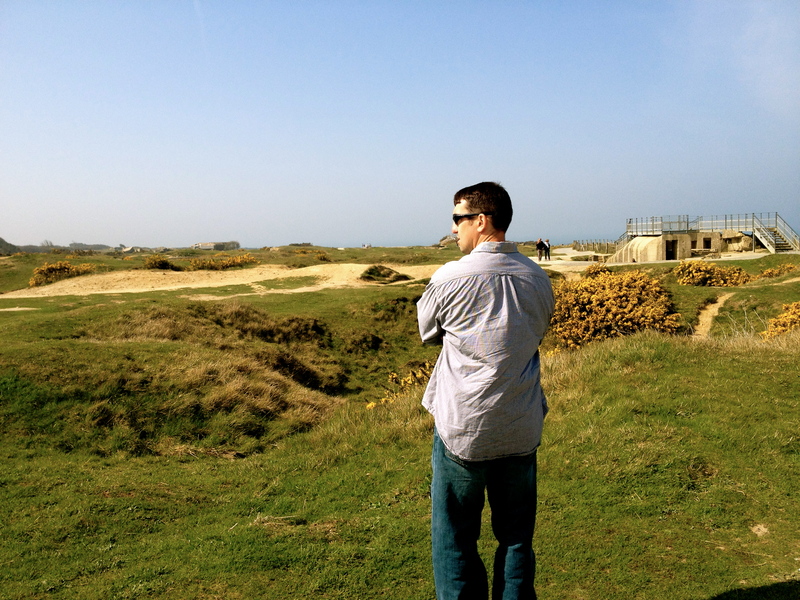 This simple conversation flooded memories of my visit to Normandy, France last year. I have tried several times to pen the experience in an essay—hopefully one which would one day be published—but the words have come so slowly; with much expression but little central theme. A kindred spirit of mine suggested (after reading through my 3rd meandering draft) writing a pretend letter to someone who would be interested in our visit. My first thought was of my grandfathers—one alive, one passed on, both WWII veterans. 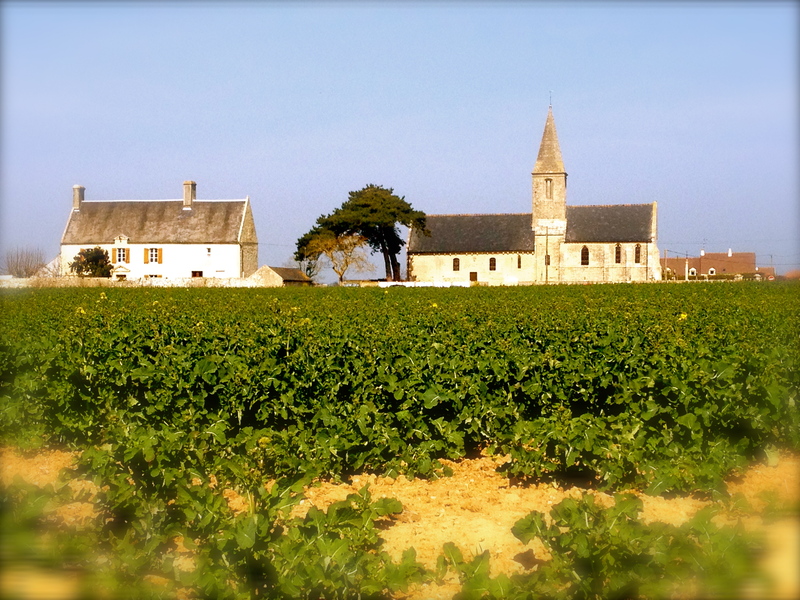 Today we traveled from Paris to Normandy. It was not a path of least resistance: a two-hour train ride from Paris, a confused 20 minutes of broken French with unimpressed ticket agents only to discover there was no public transportation to the beaches; an unintended game of chicken in our foreign rental car, driving along foreign roads with foreign road signs, leaving me occasionally breathless and oftentimes cursing. By the time Tony and I parked our little black SUV at the cemetery lot, my throat had gone dry and my legs were unreliable for walking. I had no idea spending a day in the French countryside could be so treacherous. I wondered how I would react to seeing the rows of crosses and steep pitch of the bluffs. I wondered if it would remain only a strategic game in my mind—the way it sounds when Wyatt dives into the details of troop location and timing of attack. We learn of these pivotal moments in our nation’s history from a distant perspective, so sterilized from the bloody hell they really are. Then, we become so distracted by the latest media frenzy, we never take the time to consider how we should live our lives in response to it. Once through the usual security check, we made our way to the basement museum. I found a jutting timeline along the back wall, moving me forward through the events of D-Day. I read each board’s explanation, being brought closer and closer to June 6, 1944. Finally, the battle lay before me in life sized maps, marked and colored with curved lines, rows of x’s and arrows moving inland. It is all so clean and sterile on the map, like my children’s board games. Pieces are moved, pawns are captured, but the people are just plastic and the conquered territories only tan and chocolate colored squares. Right before leaving the museum, we sat and listened to personal stories of soldiers who would take their final steps before spilling their blood upon the ground I was about to tread. Teachers, lawyers, doctors, mechanics—faces of men and their families fade from one into the other as the narrator’s smooth voice shares each one’s personal story, their lives before the war, and how they died on D-Day. I can still see the doctor’s wife. She had one arm wrapped around her husband’s waist, her hair curled perfectly away from her face and a smile that dazzled. I couldn’t help it; I sat there and imagined that pretty smile fading when she opened the door to two uniforms who told her the worst news of her life. I played out her reaction until her reaction became my own—the one I had rehearsed a hundred and one times in my mind while Tony was deployed. Maybe that is morbid. But then again, war is morbid (look who I’m saying this to!). The thought of thousands of men storming the serene beaches before me, turning the sand into blood is morbid. The idea that all those lives had to be sacrificed for securing our freedom is morbid. The crosses look just like the pictures. Only more perfect. Like the soldiers who rest beneath them, they stand at attention, creating geometric splendor by their distinct military formation: angled V’s when walking one direction, open church-like aisles when walking another, and ready to march when walking yet a third. Over 9,300 crosses and some Stars of David faced me erect and strong in their purified white stone, open to my presence. It seemed as though they were standing to attention for me. I guess, maybe in some surreal way, by the truth of their sacrifice, they were. I did my best to stand at attention back to them. What struck me throughout our visit is the way nature can, given enough time, almost entirely erase the sins of humanity. Like standing atop Cemetery Hill looking out across the field where Pickett led his famous charge in Gettysburg, I found it hard to believe such carnage could happen in so serene a setting. It’s easy to imagine hellish things happening in places like Iraq or Afghanistan; I have yet to see a redeeming picture of either place. But here? Water so clear and blue only God could have imagined it. Bluffs coming up from the beach like an alter to the Lord. 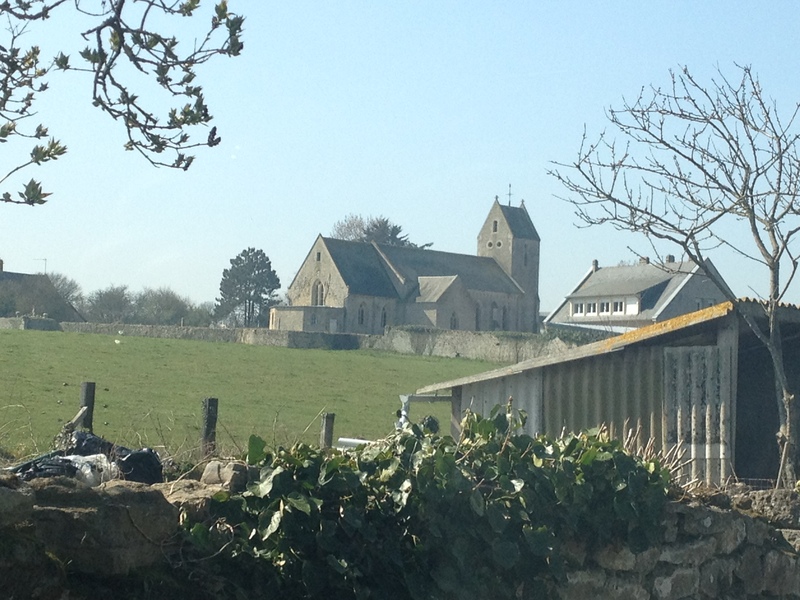 Land vast and green, dotted with stone farms and stone churches. The smell of cows and crops and simple living. Even the hedgerows—dividing lines for farms and fields—turned into props for world powers fighting their world war, then without effort turned back to hedgerows again. Only at Point du Hoc did I see the remains of war; craters deep enough to fit several large vehicles, the cement tops of German-dug bunkers, bombed out by our troops upon taking the high ground. But even these remains of war were grown over by nature’s insistence on healing herself. Places built by the sweat of hate and arrogance now serve as a child’s playground and history buff’s classroom. I worried I would not be affected by the sight of the cemetery or the climb down the hill. Or that I would be affected but not know what to do with it. But I was wrong. I was already affected. 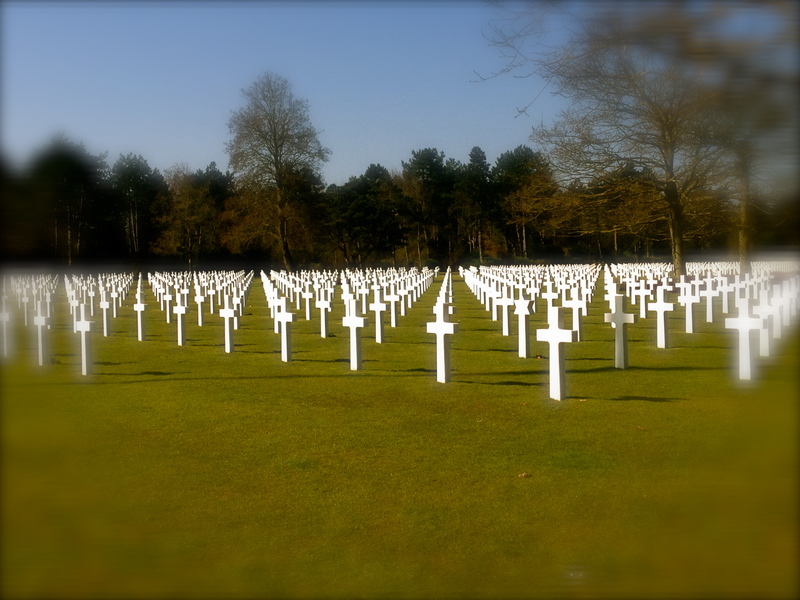 I went to Normandy with an overwhelming sense what was given so I could stand on that holy ground, undeserving of their sacrifice. Undeserving of your sacrifices—both willing to die so your future granddaughter could fly freely to Paris, hop a train to Normandy, rent a car from a foreign agent, walk amongst the crosses, along the shore, and into enemy bunkers, silently repeating the old adage over and over again: Freedom isn’t free. So beautifully written. Thanks for honoring Papa and Grandpa in such a wonderful way! Thank you for this. The makes it easier to understand Christ’s sacrifice for me. Your Aunt Ginny sent me a link to your blog so that I could read this particular post. It’s so moving! I think you’ve succeeded in finding the words to share your visit, the image you’ve rendered of the crosses in uniform, open lines like church pews is so multilayered in meaning. Your parallels to the current conflicts and your husband’s service must have given such depth and poignancy to your visit. Could you imagine visiting a seminal site of battle many years from now in Iraq or Afghanistan? 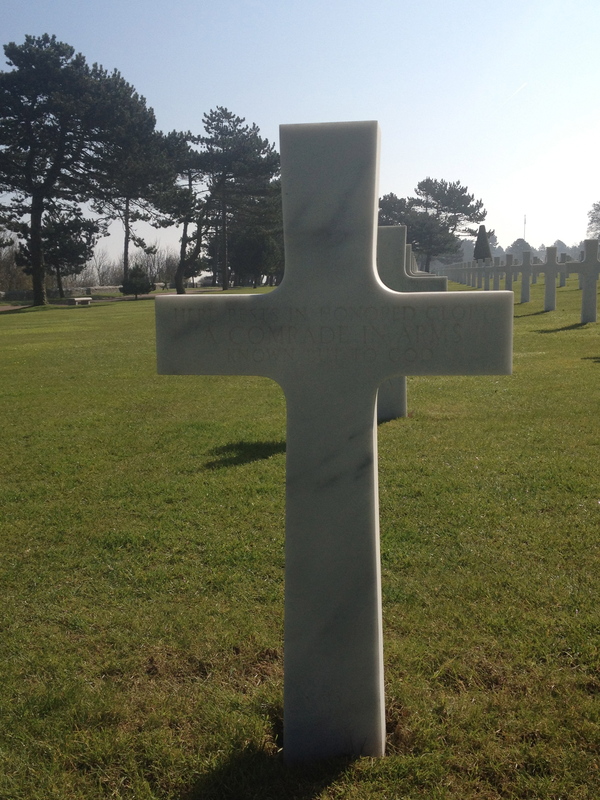 That you found so much beauty in Normandy gives validation to the sacrifice of so many men, women and families in World War II. I hope in it, you also found tribute to the sacrifices you and your husband have made for our country too.